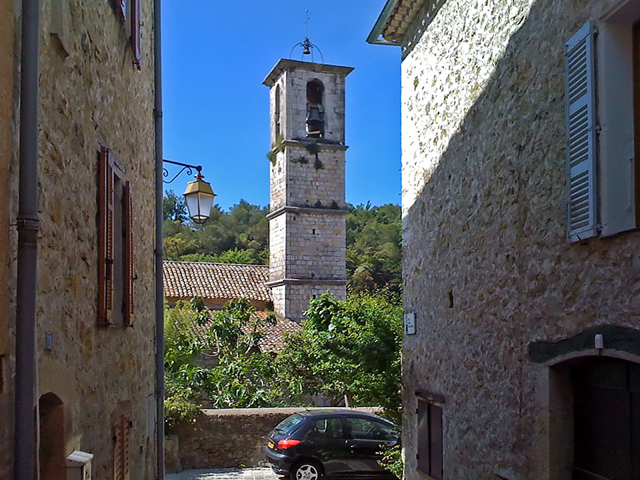 I snapped this photo of the old Valbonne church’s bell-tower at 10:39 this morning during a stroll through the village to mark the beginning of yet another four-day weekend. The old church is part of an abbey that was founded in 1199 and thus precedes the village by some 320 years. In the process of trying to find out some information about this really beautifully restored church, I was delighted to come across the web site of The Friends of the Abbey and of Valbonne’s Heritage, a non-profit organization that concerns itself with “the 12th century Chalaisian Abbey, and the old village of Valbonne founded at the 16th century.” If you have a few minutes to spare, I recommend you take a look at the history of our town.